Joint Indo US exercise, Exercise Yudh Abhyas 2017 concluded on 27 September 2017 at Joint Base Lewis McChord (JBLM), Washington, USA. Exercise Yudh Abhyas is an annual bilateral exercise designed to strengthen the US and Indian Army partnership. The training was focused on specialised drills and procedures involved in counter insurgency, counter terrorist operations in an urban environment. The initial days of field training comprised of platoon level training on basic manoeuvres, which then progressed towards company level operations. Helicopter based mobilisation of teams for quick response was also practised. The two Armies have gained from each other’s expertise and experience in conduct of platoon and company level operations. In addition the Indian contingent got a first-hand experience of operating with the ‘Stryker’ Infantry Combat Vehicle and the US Army gained an insight on the training of an infantry unit in a mountainous terrain. A closing ceremony, to commemorate the proceedings of two weeks, showcased the flourishing partnership between the two nations. The impressive closing ceremony was witnessed by the officials of both the Armies including five Indian Army Veterans. Exercise Yudh Abhyas 2017 achieved all joint training objectives and this shall further reinforce defence cooperation between the two Nations. Directorate General of Quality Assurance (DGQA) has completed 60 years of its existence. Minister of State for Defence, Dr Subhash Bhamare, graced the Diamond Jubilee celebration at DRDO Bhawan here today to mark the occasion. Addressing the august gathering, Dr Bhamre complemented DGQA for firmly supporting the combat effectiveness of the India Army and Navy while handling a very large bandwidth of technology and an inventory of equipment unparalleled anywhere in the country. Dr Bhamre appreciated professionalism, dedication and excellence of the personnel of the DGQA and went on to stress that Self-Reliance was the corner stone on which the military capability of any nation must rest and that has been the guiding principle of the government policies. He pointed out that preference given to Indigenous Design, Development and Manufacture (IDDM) has been reflected in DPP-2016. Dr Bhamre went on to highlight that numerous initiatives of Department of Defence Production like Green Channel Status and Self Certification would go long way in realising the objective of ‘Make in India’. He urged DGQA to realign itself with the best practices all over the world. Director General of DGQA Lt Gen Shamsher Singh highlighted the achievements of the organisation. He stated that all its 36 laboratories are NABL accredited and 99 of its establishments have been granted ISO certification. 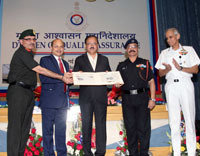 The organisation has quality assured Defence stores worth Rs. 28,878 crore during the financial year 2016-17. In addition, the organisation has been providing assistance to the User and Manufacturer in difficult and trying situations, warranting the technical expertise and hands-on experience. He also informed that during the last one month as part of their celebrations, the organisation which is spread pan India has organised a tree plantation drive wherein 23,000 saplings were planted. Though, the origin of the DGQA dates back to 1869, when the first Inspectorate was set up at Ammunition Factory, Kirkee, the organisation came into its present incarnation in 1957 when Maj Gen Pratap Narain was appointed as the first Director General on 27 September 1957. The College of Air Warfare (CAW) is commemorating the 85th Anniversary of the IAF by organising various events for serving and retired personnel. A ‘High Tea’ was hosted by all Air Force establishments located in the twin cities today at CAW in Secunderabad. Air Vice Marshal R Radhish, Commandant, CAW received the distinguished guests. Senior IAF officers present on the occasion included Air Marshal Amit Tiwari, Commandant, Air Force Academy, Hyderabad, Air Commodore RK Obheroi, Air Officer Commanding, Air Force Station Hakimpet and Air Commodore CK Kumar, Air Officer Commanding, Air Force Station Begumpet. 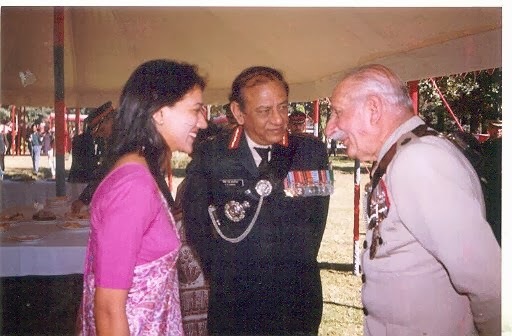 Air Chief Marshal NAK Browne (Retd) was the Chief Guest for the function. Air Marshal Janak Kapur (Retd), Air Marshal KN Nair (Retd) also graced the occasion. The event provided an opportunity for veterans to interact with their brothers in arms and relive the fond memories of their service in the IAF. The 66th Defence Accounts Department (D.A.D) Annual Day was celebrated by Controller of Defence Accounts (CDA), Secunderabad in the premises of Pay Accounts Office A.O.C, Secunderabad on 01st October 2017. As a part of celebrations today cultural programmes were conducted and prizes distributed. Chief Guest Shri K Venkata Rao, IDAS, Integrated Financial Adviser (R&D) Hyderabad speaking on the occasion deliberated on various phases undergone in the Department and the emergence of D.A.D as a Department serving the three services. He had applauded the commitment of organization of CDA, Secunderabad in honouring the children of the employees with cash prizes who excelled in the sphere of education and sports. He had presented certificates and mementos to 26 employees who have rendered more than 30 years of distinguished service. 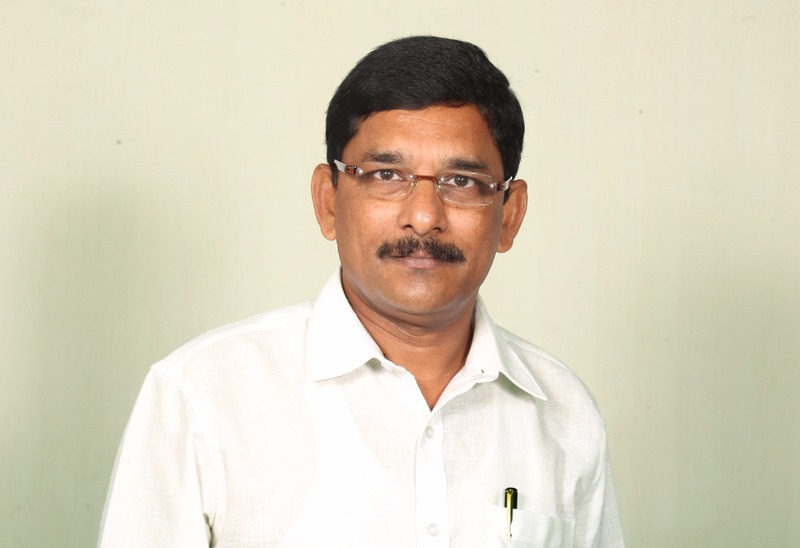 Shri T Rambabu, IDAS, Controller, CDA Secunderabad in his address, mentioned the activities undertaken by the Department in various sectors including welfare activities for pensioners and urged the D.A.D fraternity to update themselves in the changed scenario to render efficient service in both accounting and audit functions. He had honoured the meritorious children of the employees with cash awards for their achievements in education and other fields. Guest of Honour Dr. J Sirish Chowdary, IDAS, Controller, CDA (R&D), Hyderabad in his address highlighted the recent changes in the computerization of soldiers pay accounts and disbursement of Pay & Allowances to Defence personnel. He had honoured the staff with D.A.D Motivation awards 2017 that excelled in their fields and functions and set an example to others. Shri Y.Raja Reddy, IDAS, Controller, IT&SDC, Secunderabad distributed the prizes to winners in various sports activities conducted for annual day purpose. Shri A Poshetty, IDAS, Additional Controller distributed mementos for day performers (cultural programmes). The Celebrations commenced with the welcome address of Shri A Poshetty, IDAS, Additional Controller and concluded with vote of thanks by Shri Siva Sankar Bandi, IDAS, Deputy Controller. The function was attended by Shri Prem Sagar Meena, IDAS Deputy Controller, all officers and staff of D.A.D fraternity in large number. 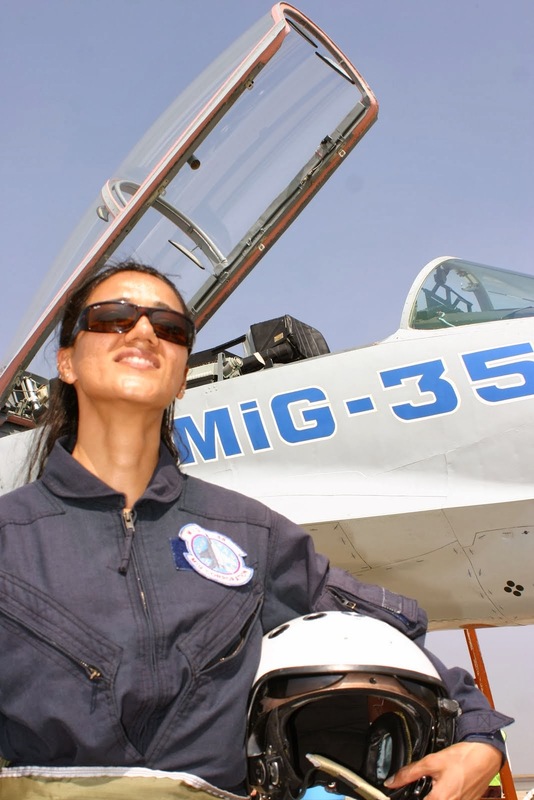 The Indian Air Force (IAF), the Guardians of the Skies, celebrates its 85th Anniversary on 8th October, this year. A Media visit was organised today as part of Air Force Day celebrations to Air Force Station (AFS), Hakimpet. The visit is aimed at sensitising and creating awareness about the role of the AFS Hakimpet in imparting training in various streams of the Air Force to the Cadets joining Air Force at the Officer level. The visit is also aimed at creating awareness and encouraging the general public to join the elite forces through media. Speaking on the occasion, Air Commodore RK Obheroi, Air Officer Commanding, AFS, Hakimpet said that it’s a premier military aviation training base of the India and one of the best training establishments of Training Command. One of the oldest stations of IAF is pride of country which trains the cadets and officers of IAF & Indian Navy into fighter flying and Indian Navy & Coast Guard into the art of rotary winged flying. Keeping pace with the dynamic continuum of aviation technology, the conversion training unit of 1952 developed into the Jet training wing in 1958, the Fighter Training Wing in 1968 and finally into the present day AFS Hakimpet in 1983. The Fighter Training Wing (FTW), previously known as the conversion training unit is the alma mater of all the fighter pilots of the Indian Air Force. In 1951 the unit was formed to groom fighter pilots to fly the spitfire and the tempest trainers. At the end of 1952 the tempests was phased out. The Vampires were inducted in 1954. Air Commodore P C Lal the then Air Officer Commanding-in-Chief Training Command, Indian Air Force inaugurated the newly constructed runway at Hakimpet by landing a Vampire aircraft and cutting the ribbon strung across the runway. Trainees from Air Force Flying College Jodhpur arrived as Flight Cadets and on successful completion of their training were commissioned and awarded wings at this station. The phasing out of high fidelity vampires took place in 1975. In July of the same year 12 Kiran aircraft arrived at the Station and in October the Polish Iskra were inducted. 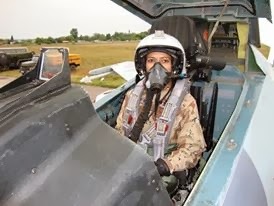 The FTW began to conduct stage IIA training on Iskra and Kiran MK II aircraft for the newly commissioned officers of the fighter stream who after the completion of their course will be tasked with protecting the nations sky with the state of the art fighter aircraft. 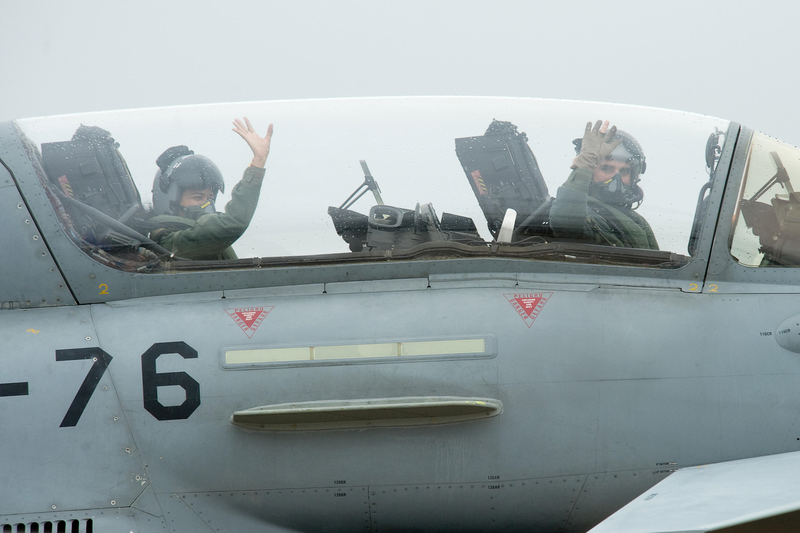 The aim of the training is to teach flying a jet aircraft as a weapon platform in war. 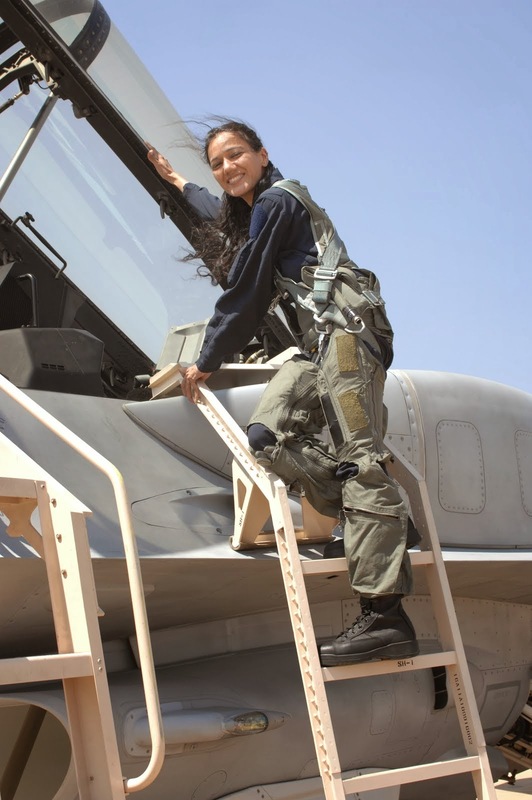 With this aim in mind the trainees are taught elementary tactical flying and basic armament. Led by their chief instructor, team of handpicked flying instructors takes great care in the development of these budding fighter pilots. Starting form 1951 till 1976 the Station had six aircraft on its inventory- Vampire, Iskra, Spitfire, Tempest, Alouette and Kiran. 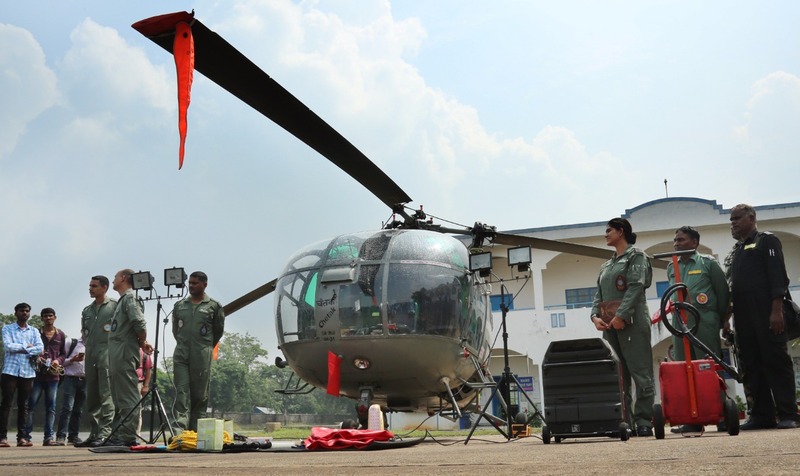 A milestone in the annals of Hakimpet was the arrival of Helicopter Training School (HTS) in 1973. HTS was raised at Palam in May 1962 as Helicopter Training Unit. 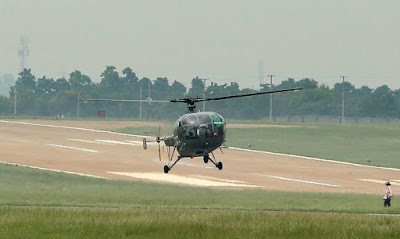 In 1967 it moved to Jodhpur as Helicopter Training School. This unit is the alma mater of all the helicopter pilots in Indian Air Force and the Indian Army. In the first six months the trainee pilots are taught operational flying and are prepared to operate the helicopter in all its operational roles. Initially the flying training was imparted on BELL 47G3 helicopter and subsequently on Chetak helicopters. The HTS has been called upon to provide aid to civil authorities in times of distress and natural calamities such as flood, earthquake, drought etc and provided much needed relief to the affected people on numerous occasions. The station also houses Technical Type Training (TETTRA) School to provide technical type of training to the prospective Army, Navy, Coast Guard and Air Force pilots prior to commencing their flying training. The school is equipped with state of the art teaching aids ranging from working models, x-ray models of various systems; computer based simulators and cut out full-scale models of aircraft. Air Force Station Hakimpet also houses a training facility for the training Non Technical Air Warriors in the Non Technical Training Institute (NTTI). The NTTI is also headed by a Chief instructor and provides training for over 200 airmen trainees in Administrative Assistant trade. The Air Force Station Hakimpet sees its inspiration in the sacrifices of its valiant air warriors and the guiding vision in “Mission Integrity and Excellence”. It lives up to the motto of Indian Air Force “Nabham Sparsham Deeptam”. The Indian Army organised a motivational guided trip for students to Army Ordnance Corps (AOC) Centre, Trimulgherry today. About 60 students including NCC cadets of class XI-XII and teachers of Army Public School participated in the great learning experience. This was the part of Southern Star Information Campaign (SSIC) of Indian Army. The objective of the campaign is to showcase capabilities, capacities and institutional strengths of Indian Army thereby positively reinforce Indian Army’s image amongst the civilian population and thus enhance positive and willing support for Army. Brigadier PK Sharma, Commandant, AOC centre extended warm welcome to the students and addressed the students. He explained in detail the rich heritage, history, training facilities of AOC centre and its contribution to the Indian Army. Later, the students visited Drona Sand Model room depicting various regions and terrain layouts like Plains, Plateaus, Mountains and Deserts. Students witnessed the conduct of Basic and Advance military training of soldiers. They were shown the functioning of state of the art Small Arms and Vehicle Simulators besides other latest training equipment and aid utilized to impart training to the recruits. Students were completely mesmerized to see the heritage building of the Officers’ Mess displaying rich traditions of the Army. 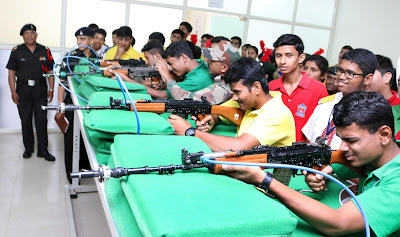 Students were taken to Recruits Training Area where they were shown the Equipment and Weapons used by the Indian Army. Students were awe to watch the muscle flexing army soldiers practicing for Army Bodybuilding Championship at the Shakti Gymnasium at the Centre. Visit to Lieutenant Navdeep Hall and the War Memorial was truly inspirational and a tribute to the achievements of the soldiers. All the students were greatly motivated by the event and gained tremendously from detailed briefing by selected instructors at all training areas. The Indian Army’s Regiment of Artillery celebrated its 190th Raising Day’ today across the Telangana and Andhra Sub Area (TASA). The ‘Raising Day’, which is also known as the ‘Gunners Day’, is observed on Sep 28 to mark the raising of the first Indian Artillery unit, the then 5 Bombay Mountain Battery, on this momentous day in 1827. The GOC, TASA was dedicated a renovated Trisula Auditorium at Rajendra Singhji Army Officers Mess and Institute (RSAMI) in Secunderabad Cantonment today. A social evening also organised on the occasion of Gunners day at RSAMI. Senior officers from Armed Forces and veterans attended the function. Earlier, a wreath laying ceremony was organised at Artillery Centre, Golconda. The wreath laying was a fitting tribute to the valour of all the Gunners who have made supreme sacrifice in the service of the nation. Veer Naris (War Widows) were felicitated with financial assistance on this occasion. 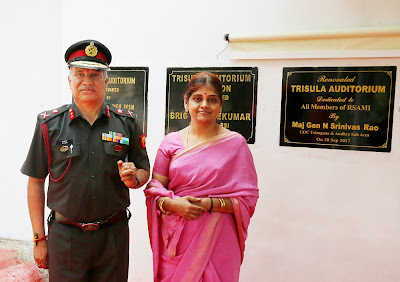 The senior most serving Artillery Officer in the station, Major General N Srinivas Rao, General Officer Commanding (GOC), TASA called upon all the Gunners to rededicate themselves to uphold the ethos and spirit enshrined in the motto of the Regiment of Artillery, ‘Everywhere with honour and glory’. General Srinivas Rao praised the professional standards and ethos of the gunners and called upon the Artillery units to reach even higher standards of excellence and continue to contribute towards peace and stability in the Indian Subcontinent. Ever since the concept of causing destruction to the enemy’s war machine from a standoff distance evolved in warfare, Artillery has been a major battle winning arm and its importance continues in the modern day battlefield. The Regiment of Artillery has been part of all the wars that India has fought since its independence and the gunners have proved their mettle by their professional acumen and dedication. The victory of the Indian Army over Pakistan in the Kargil conflict in 1999 demonstrated the fire power of the Artillery, which pounded and systematically destroyed the enemy’s will to fight, and proved to be the major battle winning factor. The Gunners have always been renowned for their professional excellence and exacting standards, and continue to perform their duties in the Northern theatre with utmost dedication, in difficult, hostile and inhospitable terrain conditions. The Gunners are also actively undertaking counter insurgency operations in Jammu and Kashmir and have made an immense contribution in ensuring peace in the region. 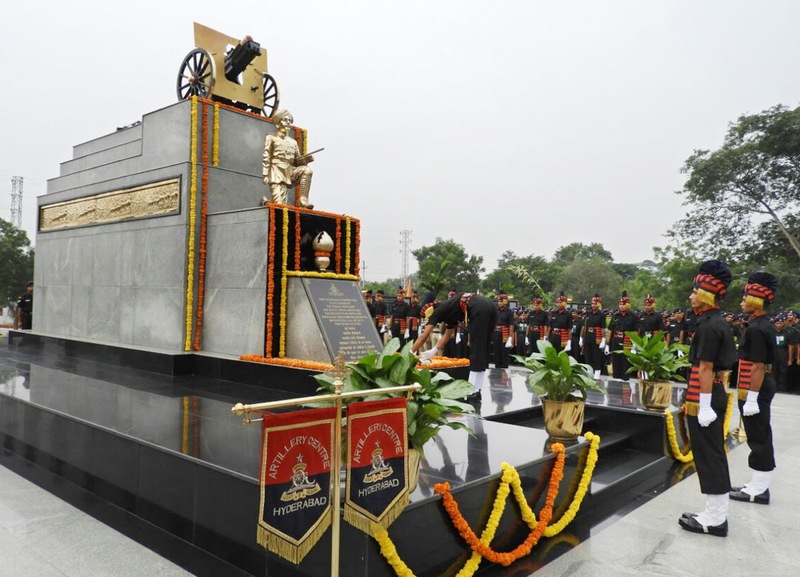 Regiment of Artillery, one of the largest Arms of the Indian Army celebrated 190th Gunners’ Day on 28 September 2017. The Gunners’ Day is celebrated to commemorate the raising of the first Indian Artillery Unit namely, 5 (Bombay) Mountain Battery on this day in 1827. Over the ages, Artillery has proven to be the arm of decision, a battle winning factor and will continue to be the pivotal arm in all future battles. The Regiment of Artillery today embarked itself on a path of modernisation, both in terms of equipment and support systems as well under the “Make in India” initiative of the Government of India. On this auspicious day, wreathes were laid at Amar Jawan Jyoti by Gen Deepak Kapoor (Retd) and Lt Gen PK Srivastava, Director General Artillery and Colonel Commandant, Regiment of Artillery to honour the sacrifices of our fallen heroes. A large number of veteran officers were also in attendance. Lieutenant General RK Anand, General Officer Commanding (GOC), Dakshin Bharat Area (DB Area) visited severely disabled soldier Sepoy Tirupathaiah who is admitted in the Intensive Care Unit of Military Hospital, Secunderabad today. 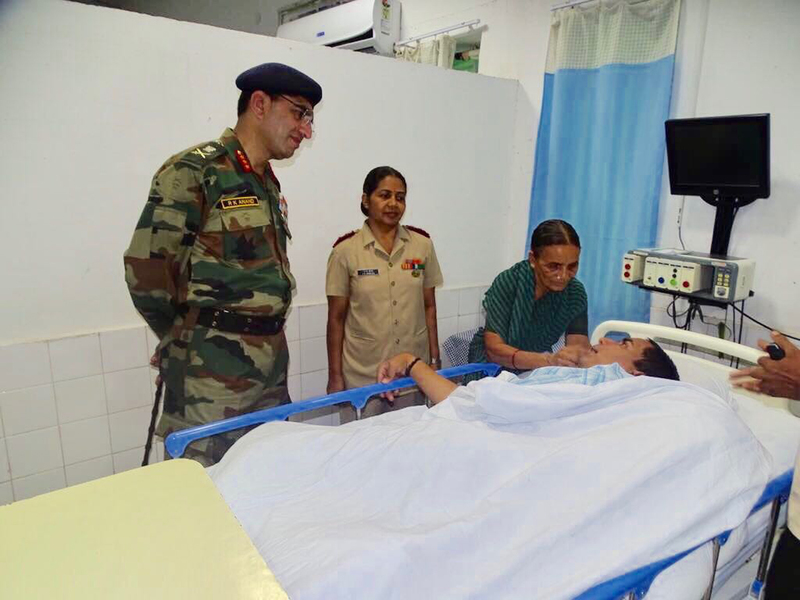 The soldier is undergoing treatment for hypoxic ischemic encephalopathy. 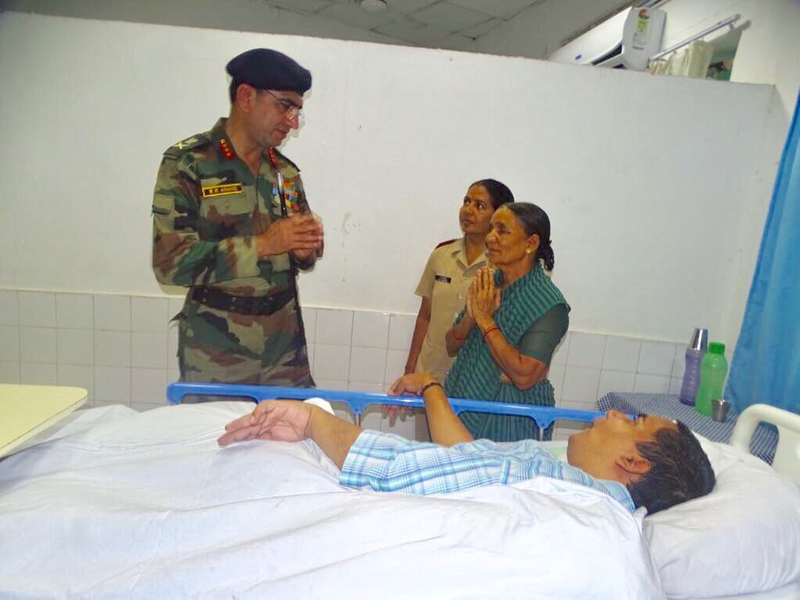 The General Officer interacted with the soldier's mother, Smt Seelam Pullamma and presented her a cheque of Rs 2 lakh as a financial assistance. The General Officer is on a visit to the state capital to participate in the Exercise Pralaya Sahayam. Hon’ble Raksha Rajya Mantri Dr Subhash Bhamre visited Bharat Dynamics Limited (BDL), Bhanur Unit today. On arrival, he was given a warm welcome by CMD, BDL, Shri V. Udaya Bhaskar. Hon’ble RRM met senior officials of the organization. CMD apprised him about the production activities being carried out at BDL and the future expansion plans. He visited various production facilities at Bhanur Unit. 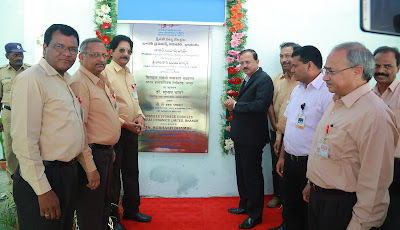 On this occasion, state-of-the-art SAM Storage Cubicles facility was inaugurated by the Hon’ble RRM. Indian Army and Jamia Millia Islamia University (JMIU), New Delhi recorded their mutual intent for academic collaboration, technical advancement and progression of Army Personnel, in a MoU signed on 28 Sep 2017 between Lt Gen Ashwani Kumar, Adjutant General, IHQ of MoD (Army) & Prof Talat Ahmad, Vice-Chancellor, Jamia Millia Islamia University (JMIU). The University agreed to recognise the in-service courses run by the Army. This would facilitate admission of defence personnel in second or third year Graduation/Post Graduation/Doctorate programme through the medium of distance learning. This would enable the soldiers to enhance their academic qualification for a better future. Speaking on the occasion, Lt Gen Ashwani Kumar recalled the contribution of JMIU towards nation building, respecting the cultural and religious diversity and emphasising the inclusive spirit of our Nation. Defence Minister Smt Nirmala Sitharaman visited the Chinar Corps in Jammu and Kashmir (J&K) today to review the overall security situation prevailing in the Valley. Accompanied by the Chief of the Army Staff General Bipin Rawat, Smt Sitharaman was received by Northern Army Commander Lt General D Anbu and the Chinar Corps Commander Lt Gen J S Sandhu. She visited the forward areas and was briefed about the robust counter-infiltration posture along the Line of Control. The Defence Minister was subsequently briefed by the Army Commander in Badami Bagh Cantonment on the prevailing security situation in J&K and was given an overview of the counter-infiltration and counter-terrorist operations undertaken in the recent past. She appreciated the effectiveness of the intelligence and operational grids and commended the troops for the excellent operational successes, which had contributed significantly towards a secure environment in the State. The Minister complimented the commanders for the high level of synergy achieved with the J&K Police and Central Armed Police Force. Later in the evening, she called on the Governor Shri N N Vohra and also interacted with the Chief Minister Ms Mehbooba Mufti. Smt Sitharaman will be staying in Srinagar overnight and will fly to Thoise (Siachen) tomorrow. The Army Ordnance Corps Centre, Secunderabad organised a trekking expedition to Milam – Pindari Glacier (Traill’s Pass) located in Uttarakhand which is considered to be one of the most challenging treks in the country. The trek commenced on 05 Sep 2017 from Loharkhet and successfully culminated at Munsiari on 22 Sep 2017. The team of mountaineers led by Major Chirag Chatterjee traversed through snow bound areas, glaciated terrain and avalanche prone slopes of over 17000 feet. The terkkers faced inclement weather for four days at a stretch and survived with minimal rations at sub zero temperatures without any communication with the outside world. Out of the 88 attempts made in the past to cross Traill’s Pass since the time it was discovered by George William Traill in 1830, only 15 attempts were successful because of the difficulty posted by the glaciated terrain and a 800 feet vertical rock wall. Such feats would go a long way in inculcating the spirit of adventure in the younger generation. The software provides valuable data for decision and policy making for the Defence Security Corps Directorate. After launch of this software, Defence Security Corps troops would be able to access their service profiles, statement of accounts and adjustment of allowances at par with the troops of Indian Army. The software has been developed by Tech Mahindra.